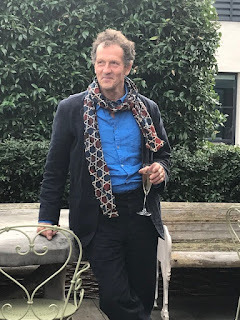 I was delighted to be invited to a book launch for Monty Don's new book 'Down to Earth' which is published today by Dorling Kindersley. I was very excited about going to the event which was held at Ham Yard Hotel in Soho in their roof garden. and aubergines. The garden was well laid out and beautifully maintained. It was a fine venue for launching a book about gardening. 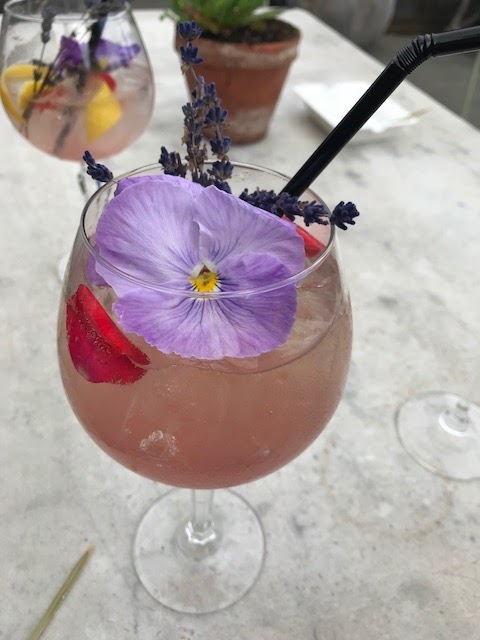 We were treated to these rather wonderful cocktails with flowers in them. They tasted as good as they looked and made the event flow rather pleasantly. Then Monty arrived, looking rather dapper. Monty introduced the book to us and gave a short talk about how it came to be. Monty explained it was the first book he had not been commissioned to write for many years and that once started, it almost wrote itself. You could tell that this book means a lot to him. This was all very lovely, but what matters most of all is the book itself. We were all given a copy and Monty kindly signed each one and had a chat with us all. I have not completely read the book yet, it is quite a thick volume. I have read quite a bit though as it is quite hard to put down. It is a really interesting and personal book. This book is Monty talking directly to us, he addresses us from the book time and time again. He is not telling us how to do things, it is not an instruction manual. Monty is giving advice and sharing his knowledge, this is not a 'how to', it is more of a 'why' you should garden. This book shares his philosophy and his core beliefs about the value of gardening. I started buying Monty's books many years ago, I have always enjoyed his writing and I find his books carry his voice strongly. So when the book opens with 'Know and go with the seasons. Do not fight them - you will lose', you can hear Monty saying this and meaning every word. The sage advice continues in this vein. The chapters of the book cover a wide range of subjects. You start with the Seasons, move into weather and nature. Other chapters cover children and fungus, pests, tools and food. There is a section on plant names, which is a short plea to us to know the names, Latin and common, of what we grow and to know their provenance. The book then completes with a chapter per month, what we should plant, what jobs need doing, what vegetables to grow/harvest. There is not is a chapter about pets/dogs, I was a little surprised at this as with a book so personally written you might have expected a mention of Monty's dogs Nigel and Nell. I assume that this is because Monty has not long published a book about dogs; he can rightly consider this subject covered. 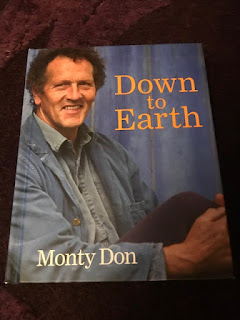 What exudes from this book is Monty's extensive knowledge and his connection with his garden and gardening as a force for good. 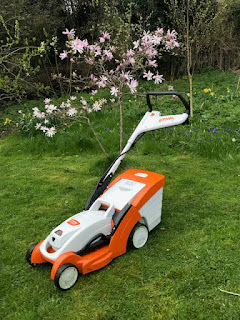 I loved that he tells us that we all experience our own gardens differently, we have to garden with our gardens, our weather and how the seasons turn. There is no point in trying to follow a rigid calendar as our gardens all behave differently due to their own conditions and climates. I also loved that Monty allows his sense of humour into the book; a little devilish twinkle runs through the book at times and I imagined him writing it with a wry smile. One of the nicest touches of the book is that Monty took many of the photographs himself and some were taken by his wife Sarah. 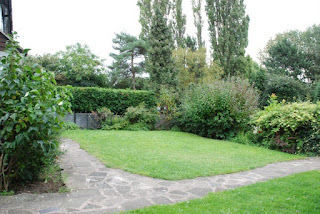 The photographs show a different Longmeadow than the one I think we see on Gardeners' World. Some of the photographs show the garden in winter and they actually give a better sense of its structure and layout. and even though photos of me are rare, this one had to be done. The more I read of this book the more I think it is the book that Monty needed to write; for this book gathers the threads that run through all his other books. It binds them together and leads to to understand better his fundamental beliefs about gardening. Whilst I think it fair to say that Monty has always put a lot of himself into his books, this one joins together the person and the garden and shares that love and knowledge. Do I like the book? I do very much and I can heartily recommend it. So nice to meet Monty Don Alison and what a nice photo of the two of you with the book. I also have almost all his books and definitely shall buy this too, certainly after your review. Many thanks for your honest review of Monty's new book Alison, I am awaiting delivery later today of my copy and can't wait to read it. That sounds like a terrific book and I am putting it on my Christmas list! I'm trying to restrict my book buying but I'll definitely look out for this at my local library; it sounds like a jolly good read. I have ordered the book, I think Monty is similar to Christopher Lloyd, although he wouldn't think so, in that you can hear their voices in their writing.